INTERNATIONAL, 10 April 2019, Women - More than four in 10 women in 51 countries surveyed, feel they have no choice but to agree to their partner’s sexual demands, the UN sexual and reproductive health agency, UNFPA, said on Wednesday, noting that they are also unable to make basic decisions about getting pregnant and accessing health care for themselves. INTERNATIONAL, 10 April 2019, Human Rights - Concluding “five intense, interesting and rewarding working days” in Mexico, the UN High Commissioner for Human Rights said on Wednesday that the country was going through a “crucial” period where it needed to reckon with “the shadows of the past”, before it can move forward. Recalling enforced disappearances, clandestine graves, tortured detainees and other human rights violations, Michelle Bachelet said in a statement she delivered in the capital, Mexico City, that she was heartened the new Government of President Andrés Manuel López Obrador, had committed as a “State responsibility” to “search for the disappeared and establish truth and justice for the families and victims”. “My Office will be an ally that will not hesitate to assist in the investigations”, she affirmed. “We will acknowledge when authorities fulfil their commitments to the families of the victims, and we will also point out any lack of progress in the case”. 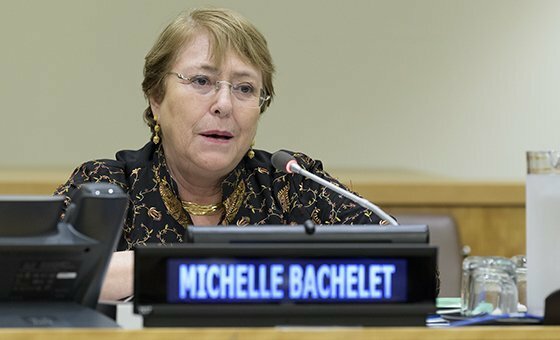 Recognizing that disappearances continue, Ms. Bachelet said that “adequate mechanisms” must be put into place, such as a truth commission “to guarantee the establishment of the truth for the victims and for society in general”. Throughout her visit, she met with families of disappeared children, government officials and many others, noting that more than 40,000 Mexicans have officially disappeared – a quarter of them women and girls – and 26,000 unidentified bodies registered, along with 850 unmarked graves. “These figures are deeply disturbing” Ms. Bachelet noted. “The search for truth is closely related to the search for justice. The wounds that are not clean, will not heal,” she declared. “The open wounds of the past, and those that persist in the present, demand truth, justice, reparation and guarantees of non-repetition. Healing will not come automatically; it will be the result of concrete actions and policies. Change and results are needed and possible. Ms. Bachelet lauded President Obrador’s willingness “to put human rights at the centre of his Government”. “I recognize his determination and express my readiness and that of my Office in Mexico to support this important policy change”, she stated. She pointed out that even before assuming office, the Government had invited her to visit, and that she had done so at the very beginning of the President’s mandate, calling the move “an openness to strengthen cooperation with international organizations” to foster a society that respects human rights. “The first steps in this direction are fundamental”, she stressed, saying that “the Government has acknowledged the State’s responsibility for serious and widespread human rights violations, and has apologized” for decades of infractions. “More importantly”, she continued, “it has taken some steps to unveil the truth, provide justice, give reparations to victims and guarantee the non-repetition of these violations”. Highlighting the emblematic Ayotzinapa case, where 43 students of a teaching school disappeared, their alleged murder subsequently covered up amidst corruption and mismanagement allegations, the UN rights chief said the Government and her team would collaborate and finally unearth the full truth. 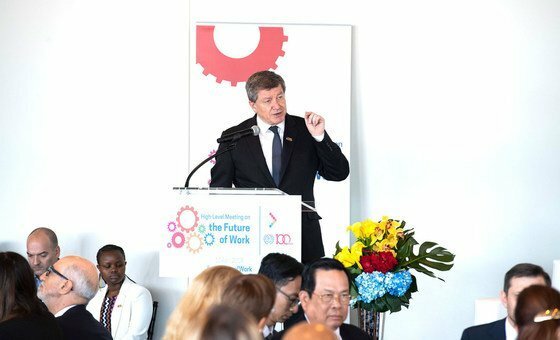 INTERNATIONAL, 10 April 2019, Human Rights - The International Labour Organization (ILO) has been “a trusted voice” to “ensure social justice in every corner of our world”, Secretary-General António Guterres said on Wednesday, at a high-level meeting to commemorate the centenary of what was the first ever United Nations agency. INTERNATIONAL, 9 April 2019, Peace and Security - An imminent UN-led Libyan conference seeking to set up elections for the war-ravaged, oil-rich country has been postponed because of ongoing clashes near the capital, the top United Nations official in the country said on Tuesday. Ghassan Salamé, Special Representative of the UN Secretary-General and Head of the UN Support Mission in Libya (UNSMIL), made the announcement after condemning Monday’s attack by the self-styled Libyan National Army’s (LNA) aircraft against Meitiga airport, Tripoli’s only functioning terminal that is available for civilian use. The conference was hoping to reach agreement among the various political factions after months of UN-led discussions at a local level nationwide, towards democratic elections which would unify the country and lead to way to economic recovery. The development follows concerns voiced by the UN human rights chief, Michelle Bachelet, that attacks against civilians and civilian infrastructure in recent days, may amount to war crimes, including those by LNA commander Khalifa Haftar. The spiralling violence comes after years of instability that have followed the overthrow of President Muammar Gaddafi in 2011, with the internationally-recognized and Tripoli-based Government of National Accord now, in effect, under assault from eastern Libyan military commander Khalifa Haftar’s forces. More than 3,400 people have fled fighting near Tripoli in recent days, the UN has warned, in addition to “47 dead and 181 wounded” in the last three days, spokesperson for the World Health Organization (WHO), spokesperson Tarik Jasarevic said. “The current clashes are burdening the already overloaded health system with frequent supply chain breaks,” Mr. Jasarevic explained, noting that as Libya’s year-old conflict “has dragged on, hundreds of primary healthcare centres and more than 20 of its hospitals have been damaged or closed”. In addition to overstretched health services, the WHO spokesperson noted that one of two doctors killed at the weekend “was reportedly killed while working as part of a field ambulance service”. Meanwhile, amid reports of clashes involving heavy artillery in residential areas of Tripoli, the UN human rights office, OHCHR, reiterated its fears for the safety of migrants and refugees held in detention centres. Those concerns were echoed by the UN Refugee Agency, UNHCR, whose spokesperson Babar Baloch, said that staff had been in contact with anxious detainees, who number 5,700 in official detention centres. INTERNATIONAL, 9 April 2019, Migrants and Refugees - In a heartfelt briefing to the Security Council on Tuesday, Filippo Grandi, United Nations High Commissioner for Refugees, has said that, during his three and a half decades as an international civil servant, he has “never seen such toxicity, such poisonous language in politics, media and social media,” directed towards refugees, migrants and foreigners. At times - pointing his finger at Security Council members for emphasis - an animated Mr. Grandi said that the stigmatization of refugees and migrants is “unprecedented,” and that traditional responses to refugee crises appear increasingly inadequate. INTERNATIONAL, 9 April 2019, Humanitarian Aid - Nearly one month after Cyclone Idai slammed into the southeast African coast, the streets of Mozambique’s busy port city of Beira are “returning to life” as the search for survivors continues throughout neighbouring Zimbabwe, the International Organization for Migration (IOM) said on Tuesday. “The challenge now is shifting to the outlying countryside”, IOM said, pointing to Beira’s Buzi River district in the southwest, which was only accessible by helicopter until last week. Stating that it would begin sending damage-assessment teams there this week, IOM painted a picture of searchers driving for hours “on mostly dirt roads”, staying “several days at a time in rural villages”. Back in Beira, schools are beginning to relocate the internally-displaced families who sheltered in classrooms?? during the first hours of the cyclone. Last weekend, 50 families were relocated from the Matadouro school to the Sao Pedro emergency camp on the outskirts of the city, which IOM recently prepared with the assistance of military firefighters sent by the Brazilian Armed Forces. “My colleagues and I are working early morning until evening, seven days a week to help bring water to affected communities”, Antonio, a government installer, told IOM. INTERNATIONAL, 9 April 2019, Peace and Security - An upsurge of violence in the south-east of Niger means that the population’s suffering is increasing “with each passing month,” a UN Refugee Agency (UNHCR) spokesperson warned on Tuesday, at a press briefing in Geneva. In March alone, some 88 civilians were reported to have died during attacks. INTERNATIONAL, 9 April 2019, Human Rights - Sudan’s authorities have an “over-arching responsibility” to protect protesters, UN High Commissioner for Human Rights, Michelle Bachelet, said on Tuesday, amid reports that 70 people have died in the latest anti-Government clashes. INTERNATIONAL, 9 April 2019, Peace and Security - Further details have emerged of an attack on a school in the Yemeni capital Sana’a at the weekend which killed 14 youngsters and critically injured 16 others. Echoing condemnation of the attack, the UN Children’s Fund (UNICEF) on Tuesday reiterated its warning that a child dies every 10 minutes from “preventable causes” in the war-shattered country. “On Sunday, a blast in Sana’a killed another 14 children - one, four - in school, and injured 16...most under the age of nine,” UNICEF spokesperson Christophe Boulierac told journalists in Geneva. “More than 400 children (have been) killed and seriously injured since the beginning of 2019,” he added, noting that many of those injured in the latest attack on the Houthi opposition stronghold “are fighting for their lives” in hospital, while one girl died yesterday after succumbing to her injuries. Also on Tuesday, UN Special Envoy for YemenMartin Griffiths, said that he was “deeply saddened to hear of the tragic deaths of civilians, the majority of whom were young female students attending school in Saewan area in Sana’a, on 7 April”. Repeating his appeal to the belligerents to “make every possible effort” to end civilian suffering and “allow young Yemenis to grown up in peace and safety” by securing a politically negotiated end to the conflict, the UN negotiator highlighted that it was civilians “across the country who continue to suffer the devastating impacts of the conflict”. Asked about the deadly incident in Sana’a, the UNICEF spokesperson said that it happened near two schools at “almost lunchtime” and “students were in class”. On whether the schools were located close to potentially legitimate military targets, Mr. Boulierac replied that he was “not informed if there is a military or any kind of potential target or potential military or official building near the two schools”. “Children are also dying from disease, not only from hunger in Yemen,” Mr. Boulierac said. “A child dies every 10 minutes of preventable causes", including cholera, he added.